As the marina began to wake up, the bright sunlight streamed through our cabin window. It was only nine in the morning, but I could already feel the sunlight warming my shoulders. As our friend turned 21 today, we decided to transform Eternal Love (our yacht) into The Black Pearl, to get the pARRRRRty started (Pirate joke – awful I know!). 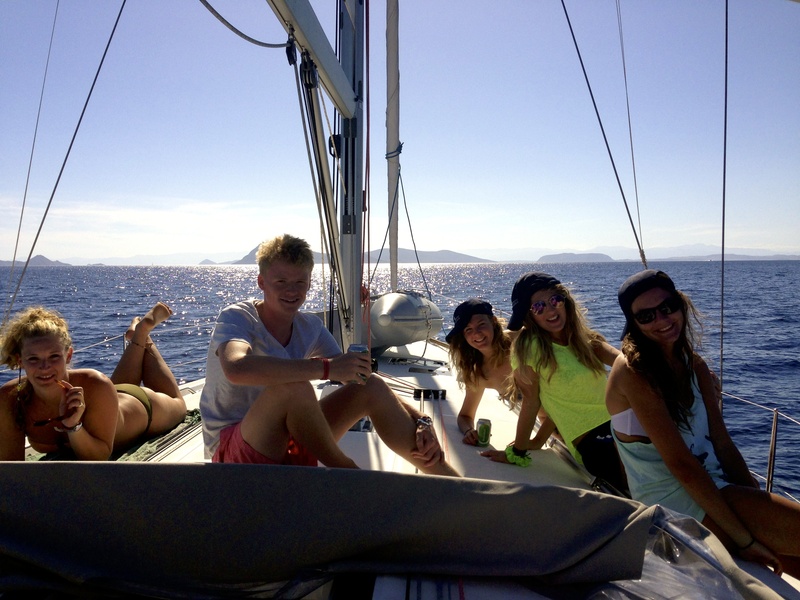 The plan was to spend all day sailing to Poros, an island renowned for its breathtaking scenery and its ‘devilish’ nightlife. So, after a delicious breakfast, we set sail – eye patches and all. 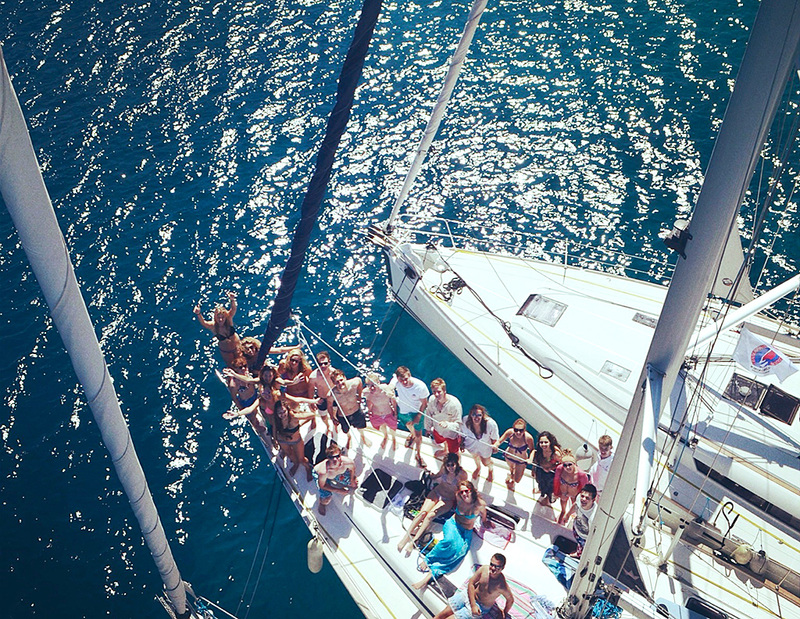 “Well Trained Crew!” After learning the ropes on Day 1, we put our skills into practice… and sunbathed! Following a morning spent sailing (dancing around the yacht and reenacting music videos); we agreed to take a pit stop. We anchored the flotilla together and whipped up a delicious homemade lunch from items we had bought at a Greek supermarket. The yachts were anchored a couple of hundred metres off the coast of a small, uninhabited island. 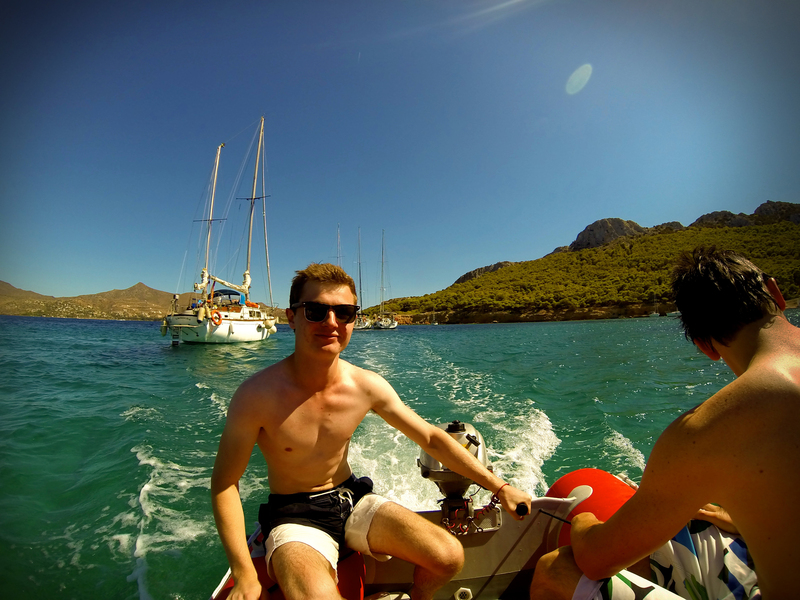 Anchored off a small island for some exploring and a swim with The Big Sail! To escape the midday sun, we decided to embark on a swim to the shore. To say my friend Elsa and I struggled with this swim would be a monumental understatement. Whilst the rest of the group triple-back-flip-summersaulted into the water and broke out into a front crawl Phelps would be proud of, Elsa and I lagged behind – limbs flailing, gasping for breath. The situation was made worse by our irrational fear of fish and our sporadic outburst of screams, after I had just seen “something” (Elsa’s foot). Half-drowning, half-laughing and after a long, long, long time, we arrived at the shore. The tiny little island was serene, as gentle waves lapped at the golden sand. We felt a million miles away. One of the skippers came up with the idea to use the dinghies attached to our yachts to motor around the little island. In a potentially dangerous turn of events, I ended up being in charge of driving! Safe to say, we all survived and the spectacular views will stay with me forever. We could have spent hours in this spot, but the sun was starting to set and we wanted to celebrate our friend’s 21st birthday in Poros. 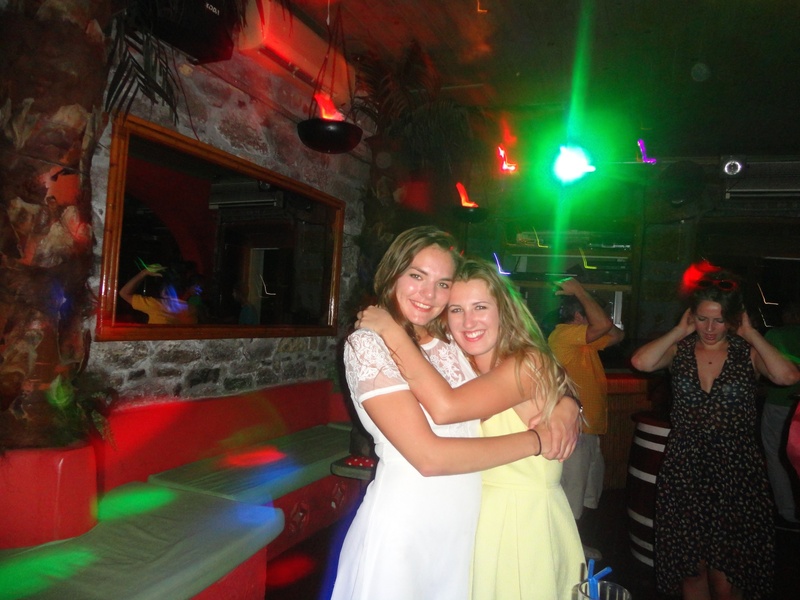 Upon arrival, the group was approached by every restaurant owner on the island, claiming he would give us ‘ze best food, the best deals and free wine!’ After a substantial amount of haggling, we ended up in a gorgeous seafood restaurant. Everyone tucked into platters of swordfish, salmon and fresh salad. As promised, the wine was also flowing! After the meal, we walked along the harbour and could faintly make out what sounded like a euro-pop remix of a Sean Paul hit. Getting excited, our walk turned into a gentle jog, until we found the sweet little haven. Lasers, smoke machines, pyrotechnic cocktails, locals and British music. Malibu Club had it all and the night got wilder and wilder. In sum, I nearly broke my leg attempting to frogs leap a barrel, my friend won a limbo competition and when the clock struck 1am, the DJ’s played a song that worshipped the devil. It was one of the most hysterical nights of my life. 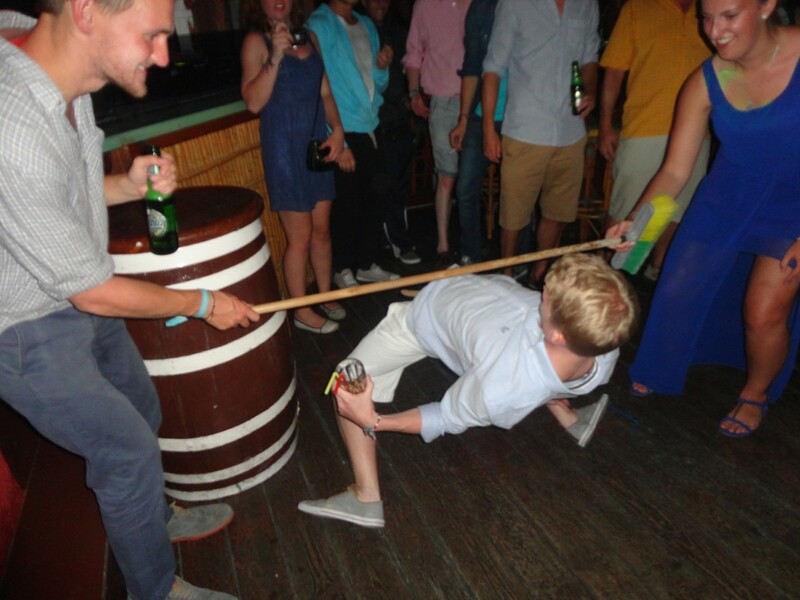 Limbo competition in full swing in Malibu as the night got weirder and wilder with The Big Sail in Poros! 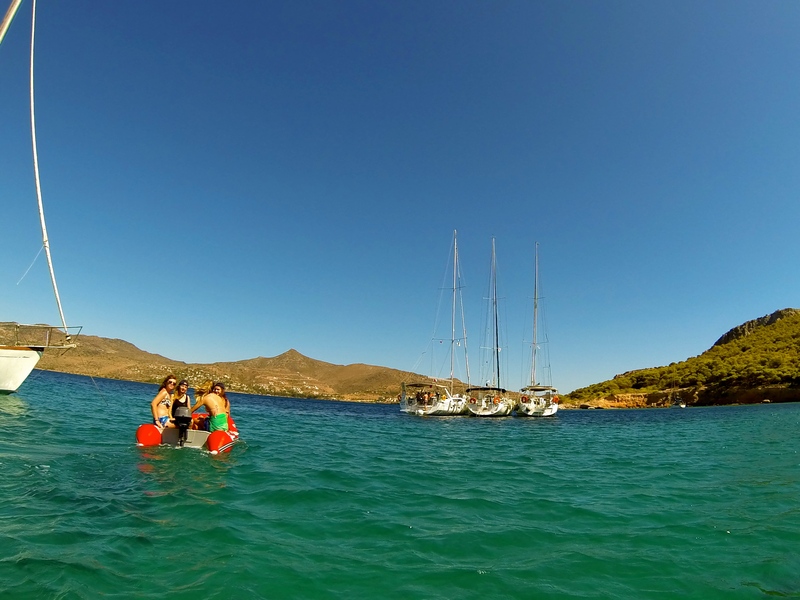 Tomorrow will see Jennifer Bell’s diary entry of Day 3 – our day of land-based activities and water-sports in Poros! To see an overview and interactive map of the whole route see this page: WHERE DOES IT ALL HAPPEN?